Parade Cafe has always been one of Wellington's most iconic cafes, packed to the rafters every weekend. And yet across the street sat the Tugboat on the Bay, one of the strangest restaurants. The Tugboat was never really be sure what it was trying to be, a tourist trap, a high-class eatery, a unique dining experience. In my opinion, it failed to really succeed at all of these. So when the Parade Cafe had to move out of its neat 2-storey old house that was squished between the ever-advancing apartment developments to make room for yet another development, it was with intrigue I heard that Parade was going to 'take on the Tugboat'. Today we tried it out for the first time (it only re-opened last month). I called to book a table and the man who answered replied 'Well we don't take bookings during the day, but when are you coming?' I gave him our information and he said 'OK, no worries we'll book one for you'. Big tick. We arrived and were shown straight to our table, upstairs in the bow of the boat. There's also two function rooms you can hire, one was about perfect for 40 people and you can hire out for $100. And apparently there is a function room for 250! down in the bowels of the ship. There are some lovely nooks and crannies dotted all over the boat, booths near the counter, smaller wooden tables in the stern with a conservatory feel all covered in glass, as well as our quiet escape up in the bow. There were also some tables outside (but not for a day like today!). I was also impressed with how spacious it seemed, and it didn't feel as if you were sitting on top of each other to eat (which cafes have a tendency to do to pack in as many tables as possible). 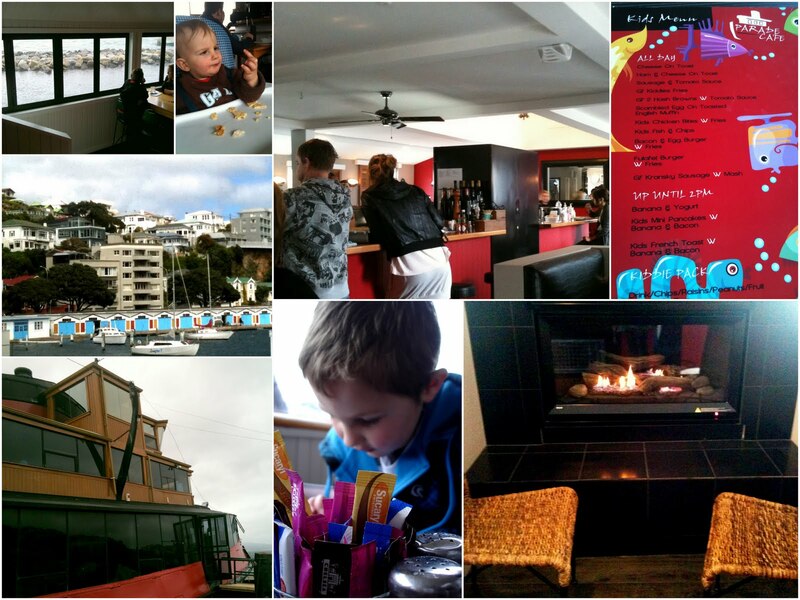 Two gas fires also provided a real cosy feel on a typical windy spring day for Wellington. Big tick. We ordered a caesar salad, pancakes with bacon and banana, corn fritters, and a kids fish n chips. Boy the food was mighty quick considering it was a weekend lunchtime and the place was packed. Big tick. There was a decent size highchair for the lil dude, who was quite happy sampling all our fare and playing to the crowds (a table of three behind us who said goodbye and waved to him as they left). Not long before we left, Piri Weepu came and sat at the table next to us. I must admit I was so blissfully ignorant that I had to be informed by the rest of our table who it was. I was too busy admiring the decor and soaking up the experience. Poor guy then broke his leg 8 hours later, not a great end to his weekend! Anyhow I digress. The makeover the Tugboat has been waiting for is complete, and a complete success too. Parade Cafe, we will be back! Big tick. What a shame they destroyed the old one, but great news that the transformed tugboat is a success. We have dined on the tugboat when it was still that and were less than impressed, so pleased to see it is being put to better use. Whoa - at first i was like - nooooo i can't believe the "old" Parade Cafe is gone - but oh so relieved to hear it has been relocated and is still as good as ever!